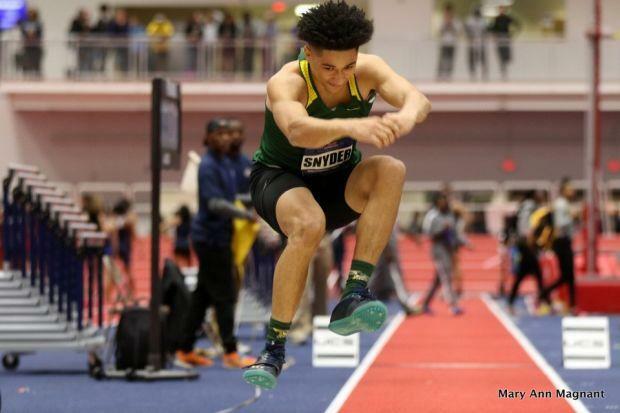 This is a common question asked by many coaches and athletes when learning to triple jump. The answer comes down to what is most effective for each individual. People have jumped very far using different styles, so there is no universal method. Going into the first phase (the hop), most of the world's best jumpers use a single-arm running motion as they pass over the takeoff board, much like a sprinter. A single-arm motion is conducive for conserving speed. By contrast, when setting up a double-arm action there is a tendency to gather the arms during the last few steps of the approach -- disturbing the running motion. Instead of attacking the board, many jumpers coast into it as they gather. Since it is a rare jumper who can sprint through a double-arm preparation without slowing down, the single-arm style seems the best way to go for most jumpers. On the second phase (the step) and the third phase (the jump), some jumpers stay with the single-arm drive all the way through. Others convert to double arms on both the step and jump or a single arm on the step and double arms on the jump. The arms are swung as long levers, not usually flexed at the elbow. When going airborne the lead knee and opposite arm swing up, with the thigh and the arm blocking in front at about parallel to the ground. The other arm is extended behind the jumper. As the jumper hits the ground, the arms vigorously switch. The back arm swings up in front, and the front arm swings back. This coincides with the knee drive during the takeoff. On the last phase, the same switch of the arms occurs again, timing up with the knee drive into the pit. If using the single arm off the board, one arm ends up forward and the other arm ends up back to the rear of the athlete. While airborne, the rear arm stays back while the front arm is drawn back to line up with it, so that both arms are back before the hop landing. As the jumper lands the hop, both the arms and the knee are driven forward and up to impart force into the middle phase. In the air again, both arms are drawn back simultaneously and upon landing they are once more driven into the last takeoff. When withdrawing both arms back before landing each phase, it is important that the hands pass below the height of the shoulders. A common error of novice jumpers is to swing the arms way too high on the way back. Arm skills need to be rehearsed in training so that they are automatic under the stress of competition. In deciding on either single or double arms, the style selected should be the one with which a particular athlete naturally feels the best leverage and timing. Sometimes an athlete cannot generate lift forces using one style, but the same athlete will generate much greater forces using the other. The best way to figure out what works for each jumper is to experiment in training. Through experimentation it will become clear which style innately works better for each individual. The following are different arm-drive sequences utilized by some of the world's best, along with video examples of each type for observation purposes.